What is a Power of Attorney and Do I need to get one? 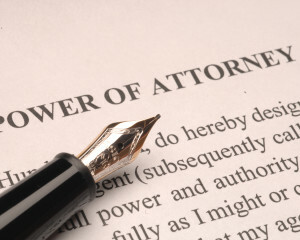 What is a Power of Attorney? Do I need one? A Power of Attorney is a legal document that authorizes someone else to act on your behalf. The person granting the authority is the “Principal” and the person (or persons) to whom the authority is granted is the “Agent” or “Attorney-in-Fact.” It is grammatically incorrect to say “I am Power of Attorney for John Doe.” The Power of Attorney is the document itself. A Power of Attorney may be limited to a specific purpose such as enabling someone to sign a deed or a car title on your behalf. It may also be a very broad Power of Attorney allowing your Agent to literally take any action that you could do yourself, such as signing checks and making medical decisions. In Pennsylvania, however, there are a number of specific actions that can only be performed by the Agent if expressly set forth in the Power of Attorney. One example is the giving of gifts. It is extremely important that you have the utmost trust and confidence in anyone that you appoint as your Agent. When you appoint an Agent, they are said to be in a “fiduciary” capacity. This means that they are in a position of trust and are required to act on your behalf. However, there still exists a great potential for abuse. The careful selection of your Attorney-in-Fact is of the highest importance. In Pennsylvania, a Power of Attorney is not valid unless the Agent signs an acknowledgment of their responsibilities. Commonly spouses will appoint each other as their agent, and perhaps a trusted adult child as an alternate. One of the most important features that we usually include in a Power of Attorney is language that makes it a “Durable Power of Attorney.” The general rule in Pennsylvania is that the authority granted by a Power of Attorney expires upon the death or legal incompetence of the Principal. A Durable Power of Attorney is still valid even if the Principal becomes legally incompetent—that is, incapable of making their own decisions. While the authority granted by any Power of Attorney still ceases upon death of the Principal, the Durable Power of Attorney has the added benefit of enabling the Agent to act on behalf of a Principal that has become mentally disabled or incapacitated. This can avoid the often significant expense of asking the court to appoint a Guardian. Do you need a Power of Attorney? In an ideal world, everyone should have one. We have always advised clients that, in general terms, the older you get the more important it becomes to have one. We have had instances where a person had a stroke, leaving them incompetent. With a Power of Attorney in place, no court guardianship was necessary. We have also seen instances where, without a Power of Attorney in place, an expensive Guardianship became necessary. Of course even a young person is at risk of a serious injury that can render them incapable of managing their affairs. A Power of Attorney is a relatively low-cost legal service that everyone should consider. If you’re interested in learning more about a Power of Attorney and whether or not it could be beneficial to your circumstances, call our office to schedule a meeting with an attorney.